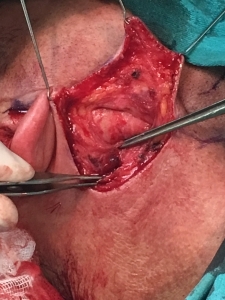 On September 29th, 2016, plastic and reconstructive surgeons and maxillofacial surgeons performed two SLN biopsies (sentinel lymph node biopsy) in patients, in whom primary localizations of melanomas were on face. 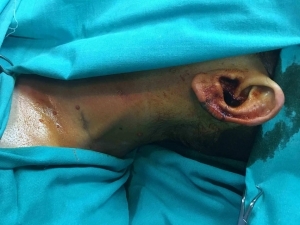 Sentinel lymph node biopsies have been performed for the past eight years in the Clinic of Plastic and Reconstructive Surgery, but this time they have been for the first time carried out in patients suffering from melanomas that have arisen in areas of the head and neck. Team was comprised of surgeons Nikola Baros, MD, Mario Mizdaric, MD, Dragan Baros, MD, and Goran Vukadinovic, MD, operating theatre technicians Pero Grabez, Davor Dragisic, Bjanka Mandic and Vanja Gruban, specialists in anaesthesia Slobodan Kovacevic MD and Aleksandar Sibarevic, MD and anaesthetic technicians Sanela Bajic and Aleksandar Ilincic. University Clinical Centre of the Republic of Srpska is the sole institution in the Republic of Srpska (and one of the two institutions in B&H) in which sentinel lymph node biopsy has been performed in patients suffering from melanoma. © 2019 University clinical center of Republika Srpska. All rights reserved.